"One of the 4 quintessential 'primi' from the Lazio region in Italy, this pasta is beautiful in its simplicity with soft guanciale and tangy Pecorino cheese. No onion, no garlic, no oil - this flavorful dish gets its character from slowly sauteeing the guanciale and then creating a creamy sauce with the pasta water and a bit of Pecorino Romano before tossing with thick spaghetti. With only 4 ingredients, this is also a quick meal when you're in a rush." Bring a large pot of lightly salted water to a boil. Cook spaghetti in the boiling water, stirring occasionally. While pasta cooks, immediately heat a nonstick pan over medium heat. Add guanciale and cook until tender, about 5 minutes. Add 1 ladle of pasta cooking water, stir, and cover pan. As pasta cooks, add another ladle of cooking water to the pan with the guanciale to create a sauce. At about 10 minutes of pasta cooking time, reserve a cup of cooking water and drain pasta. Add spaghetti to the pan with the guanciale; toss, adding reserved cooking water if necessary. Turn off heat. Add 1/3 the Pecorino Romano cheese to the pasta and toss until creamy. Divide pasta between 4 plates. Top each with remaining Pecorino Romano cheese and black pepper. Serve immediately. 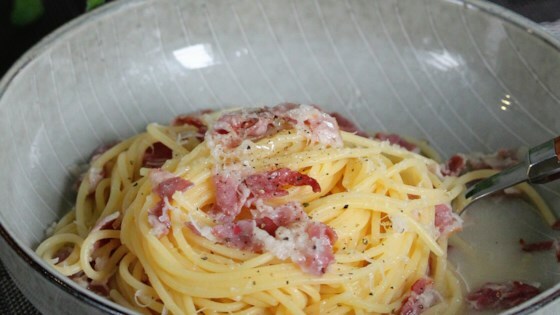 Elegant in its simplicity, Carbonara is a classic. If you cannot find guanciale, you can use pancetta instead. I made this with pancetta. My family loved it. I will make it again. This is a very easy dish. It was pretty good. A little salty for my tastes, but I had to use Pancetta...and Pancetta is always very salty to me. My friend I shared it with absolutely loved it. What can be used in place of the guanciale? Not easy to find Italian meats in my area. It looks delicious, hence the four stars.